There are many ways to get a pseudo-3d object online. I’ve written about a way to do it with flash. Next up is a java-object. 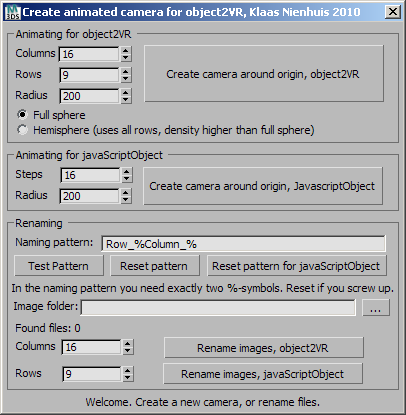 Written by Finn Rudolph, this object has less options than the object2VR program which makes it a bit easier to implement. It’s a very clean way to get 3d-stuff online though, and there are no fees for non-commercial sites. So no watermarks this time! I’m liking this thing a lot and I’ve adjusted my own object2VR script to accommodate for the naming conventions used by this java-object. Still the ordering of the frames occurs slightly different. I’ve also updated my script to perform the correct transformations. These are different than the ones used in the object2VR script. Please keep in mind that this object expects an equal amount of columns and rows. You need to render them all. After that you can specify which items you want to show in the object. For more info on the javaobject, please see Finn Rudolphs site. Notice that he has created scripts for sketchup, cinema4D and vvvv to make the sequence of rendered frames. With the inverseY option and only half of the rows used, you van display a hemisphere. That’s handy if there’s a groundplane, or if you don’t want to show the underside of an object. This is great script, but how can it chage it to use a vray camera? wondering. how come the camera is always too close to the object???? the script uses a standard camera. If you want to use another camera, you can align and link that camera to the animated camera from the script. If you want to use a larger radius for the animated camera, you can adjust the radius-parameter in the script. The default is 200 but you can set it to any other value.